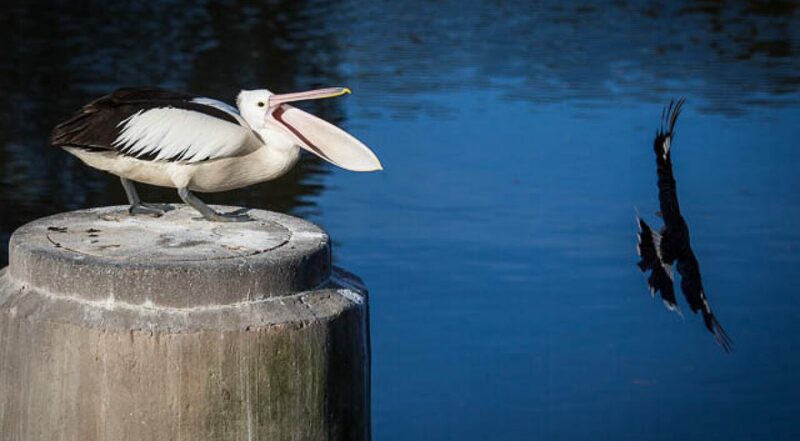 David Noble began taking photos of birds on the Cooks River about five years ago. The retired science teacher and Marrickville local shares these on his personal blog – http://www.david-noble.net/blog/ – which also contains other stunning images capturing his passions for nature and outdoor sports such as bushwalking and canyoning. Read on for insight on his experience and tips for taking great photos of birds on the Cooks River. Cooks River Alliance (CRA): What first drew you to photograph birds on the Cooks River and what keeps you coming back? David Noble (DN): For many years I enjoyed riding my bike along the cycleway beside the river and had seen the birds when out riding. I wanted to know more about them so I thought that if I photographed them, then I could identify them from the photos and learn more about them. I have been a keen photographer since a child. I am now retired so have more time to devote to this hobby. CRA: Is there a photo you are particularly proud of? DN: Yes – a series of photos of an Australian Darter taking off from the bank. I saw the Darter, perched on a stick, drain its wings. So I took a few photos of it, then waited patiently for a while, hoping to get some photos of it flying. My patience was rewarded. 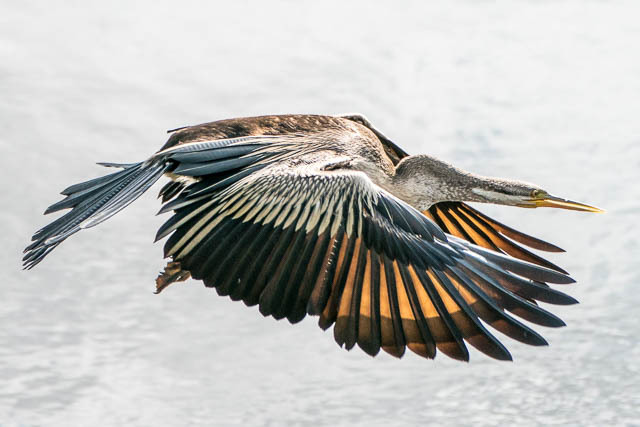 The action shot of an Australian Darter – see the rest of the photos in this series here. CRA: Is there one bird species that you particularly enjoy photographing? DN: Kingfishers. Small, shy birds that are hard to spot. Always a challenge to find them and then get good photos of them. One species that you find along the river is the beautiful blue Sacred Kingfisher. It often lives in the mangroves and hunts fish and crustaceans. I spotted a blue flash one time while standing on the footbridge near the old Sugar Mill in Canterbury. I went to investigate and spotted a Sacred Kingfisher in the process of eating a rather large mud crab. Birds can’t chew these things up – they have to swallow them in one go. Amazing to watch and photograph. Gulp! 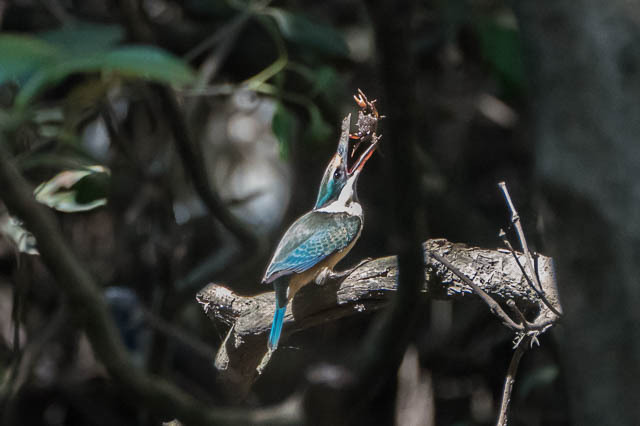 See the full series of photos of this Sacred Kingfisher enjoying lunch here. CRA: What are your tips for first-time bird photographers along the Cooks River? DN: Bird photography is one area where the camera in your mobile phone is usually not suitable unless the birds are large and close. The best cameras are those that have interchangeable lenses. Then you need to fit on a telephoto lens. Usually a lens with more than a 200 mm focal length is needed. Modern digital cameras with good autofocus systems can capture amazing photos of birds in flight, and memory cards are relatively cheap, so don’t be afraid of taking plenty of photos and later deleting a lot of duds. You need to watch the light – have the sun behind your back if possible and the bird in front of you. Also, wear subdued coloured clothing so you don’t stand out too much. Birds are often most active early in the morning . For many of the smaller birds, you hear them before you see them – so take off your headphones and listen for their calls. A lot of birds are more active in the spring when they breed and food is more abundant after winter. Some of the wading birds such as Herons and Egrets often hunt on the mudflats during low tide on the river. It’s nice to watch a bird hunting and get a photo of it catching a fish. Look up – you may be lucky and spot a Sea Eagle or Peregrine Falcon flying overhead. Look in the trees. Some of the nocturnal birds, like Tawny Frogmouths, sit very quietly during the day trying to blend in. They do this very well. 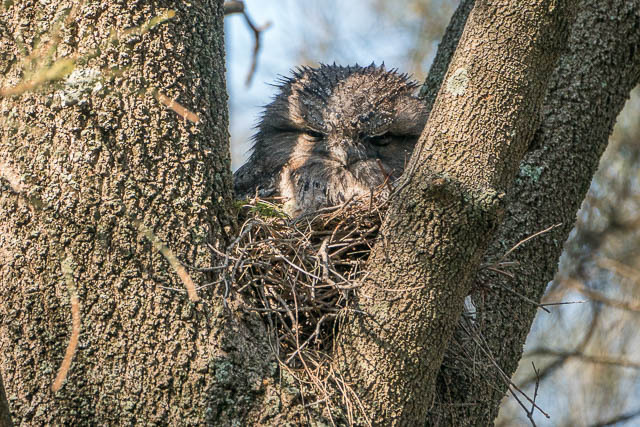 There are several pairs of Tawny Frogmouths nesting along the river at present in trees quite close to the path between Canterbury Road and Wardell Road. Tawny Frogmouth spotted in a fork in a Casuarina tree. Boat Harbour near the old Sugar Mill – often lots of Pelicans, Cormorants, Herons and other birds behind the barrier or perched on the pollution boom. Cup and Saucer Creek Wetland which is just upstream of Boat Harbour on the south side next to Cup and Saucer Creek. Lots of birds in the pools and the trees nearby. Gough Whitlam Park – near the kiosk and the tidal pool with the island. All the footbridges spanning the river are great places to wait on – birds often fly up and down the river. When birds are nesting, please respect them. Don’t get too close to the nest. And watch for swooping birds – not only Magpies. Butcher Birds, Noisy Miners and Masked Lapwings can be very aggressive when they are guarding eggs or young. DN: You need to be patient. Sometimes its better to just find a nice area and sit and wait for the birds to come close to you rather than try and go after birds. And it is interesting to watch the bird’s behaviour – whether they are courting, looking after chicks, fighting off other birds or hunting for food. You will see some amazing things. We are celebrating National Bird Week and the Aussie Backyard Bird Count. How many birds can you count on or near the Cooks River before the end of this week? We’re giving away two $100 JB Hi-Fi vouchers to the best photo or video taken of a bird in catchment. More details and full T&Cs here.